Tomatillos are one of those things that, if we don't know what they are we just don't buy. Somehow here where I live you can find tomatillos at least in two places that I know. In Mexico they are quite common and some people call them tomate verde but regardless of how they call it this little fruit is quite useful in the kitchen. I cook with this salsa lots of things like green enchiladas, green salsa eggs, baby potatoes in green salsa... you get the idea. In reality preparing salsa verde -green salsa- is very easy and the only secret lies on choosing fresh ingredients. 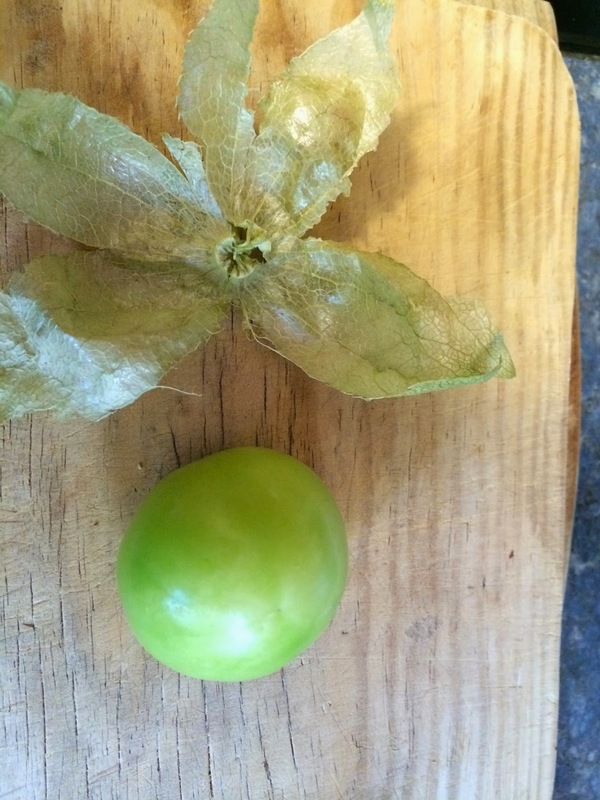 The tomatillo is a member of the little berries family (cape berries) and its originally from Mexico. As I mentioned before, it is a fruit. The plant on its own is quite pretty if you manage to grow it -I failed miserably last year- and blooms with a beautiful yellow flower that eventually transforms into the husk which will contain the precious fruit. It belongs to the night shade family but loves sun... go figure. 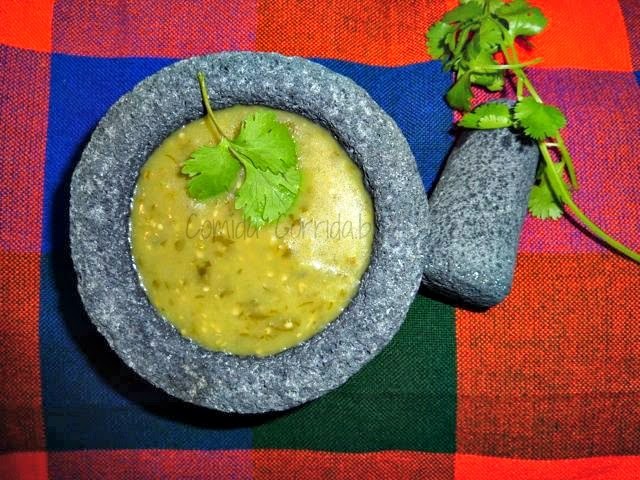 There are out there many recipes for salsa verde, no doubt, but this one (one of Frida Kahlo's favorites) is a very easy salsa to do and loaded of flavor. As I mentioned in others posts I don't eat spicy whatsoever because of my Crohns. but if like to spice things up... go crazy with the Serrano peppers! 1. Remove the husks (that you can keep for couple of days if you are cooking tamales) and wash the tomatillos as they are a bit sticky just fresh out of the husk. 2. We are going to cook in a medium pan with lid all the tomatillos (don't cut them!) in medium heat... and you probably are going to think that one cup of water is not enough...I promise it is. Cover and cook for about 15 minutes or until most tomatillos are a bit soft but they are not disintegrating. 6. In a big frying pan we heat the oil and sauté the onion until a bit clear -at medium high- and then we can add the Serrano peppers roughly chopped for about half a minute. As I mentioned before, I don't use any peppers whatsoever and nobody that has eaten my dishes ever complained. 7. When the onion is a bit clear we add the tomatillo/cilantro mix and mix toughly. Then we keep it, low-medium heat, covered with a lid for 20 minutes. You can stir now and then. 8. After the 20 minutes our salsa should be almost ready so this is the perfect time to add salt to taste. In my case I only add half a teaspoon. 9. Now the salsa is ready and the house smells fantastic. Now we can serve accompanying tacos, green enchiladas, with totopos (crisps tortillas) or you can just can it for a later time, which I do. It freezes very well also. ** Some people like to add two garlic cloves and fry them with the onion (chopped).. I don't do it because somehow I think it overwhelms the tomatillo flavor. I feel very blessed because there are some people who I consider extraordinary and, some of those are either my friends or my family. In this case my nephew Patricio Betteo, an excellent illustrator and artist is one of those. A very successful and busy man with a big heart. He has created and given me the header for this blog. He told me that I should look at it and tell him what I thought and... he was open to changes. How can I change my fantastic new header? He is as creative as he is perceptive. The header is just...perfect. I love it. From this corner of the planet I want to say to Patricio (Pato)...GRACIAS!!!!! I am so lucky... and today I am humbled because of him. I really am. Eating a cheesecake is like tasting a bit of heaven. Somehow cheesecake is one of those cakes that almost everybody likes. I do...quite a bit. 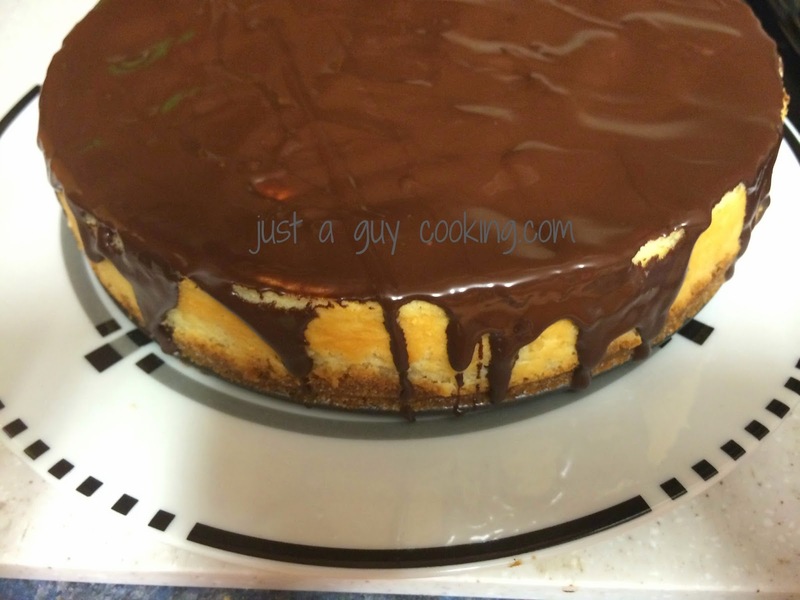 I do quite often cheesecakes at home because are a crowd pleaser and I have baked many many versions of it. The most complicated has been the New York style, because of the scale and the most laborious have been the individual sized ones. Adding some additional flavor makes each one a bit different. This one combines Grand Marnier, Valrhona chocolate and cocoa nibs. Can;t get better that that. It is one of my favorites, no doubt. Also you might ask...why not to substitute the expensive Grand Marnier with something...more affordable. That is OK, just change the recipe's name. I like this one a lot. 1. In a medium size bowl combine the cracker crumbs with 1/3 of the granulated sugar and the melted butter until fully incorporated. 4. In the bottom of the oven -or the bottom rack- place a shallow baking pan with boiling water and turn on the oven to 300˚F. The rack for the cheese cake will be in the middle. 5. In a mixer combine the cheese with the rest of the sugar until combined, then add, one by one, the eggs and keep mixing until incorporated (you will get a semi-liquid mix…don’t panic, that is what we are looking for). 6. Add the vanilla and the Grand Marnier and mix a bit more until incorporated. Take a deep breath because the aroma is fantastic. 7. Finally fold the cocoa nibs and pour the mix into the prepared pan. 9. When ready, remove and place the cake in a cooling rack for 2 hours without opening the mold. 10. While the cake cools down we are going to prepare the Valrhona chocolate cover. First pour some water into a medium size pan that can fit a glass or metal bowl on top -without the bowl touching the water- and put it on the stove, medium-high. 11. Put the metal bowl on top of the boiling water pan and pour the Valrhona chocolate pieces so it melts slowly. Keep stirring until all is melted and forms a smooth texture. 13. Once the chocolate cover is even, put the cheese cake in the fridge and allow it to cool for at least 4 hours, then with care remove the bottom of the spring form pan and put the cheese cake in a presentation plate. I am almost sure that you know how to prepare the famous "Huevos Rancheros" but this dish is a showstopper and a super delicious hearty breakfast. The only thing you must have in mind is that with this dish you won't eat lunch and have doubts about dinner (I never have doubts about dinner...but again...it's me). This recipe got my attention when reading Diana Kennedy's "My México" and adapted it so it would make sense to me. The end result was a very tasty breakfast that made me forget about lunch... but not for dinner. It just happen that today I had some freshly made beans -this week are pinto- and I had some fresh cilantro in the fridge. That did it: today was the day of Huevos Encobijados. 4 Tbsp Grated Oaxaca, Chihuahua or Mozzarella cheese, grated. * If you like your tomato sauce hot and spicy you can add 1 or two chopped jalapeño peppers and mix so it incorporates with the sauce. 2. Fry the two tortillas (both sides each) so they get a bit golden but not too crisp, once ready dry them in a paper towel to get rid of the excess oil. Put in a warm plate one of the tortillas, the other one reserve. 3. With the refried beans form a “wall” in the tortilla’s perimeter, about 1/2” high. Reserve. 4. Fry the egg and place the egg inside on the tortilla that is on the plate -surrounded by the refried beans- and cover with the chopped cilantro. 5. Cover the tortilla/egg with the other fried tortilla. 6. 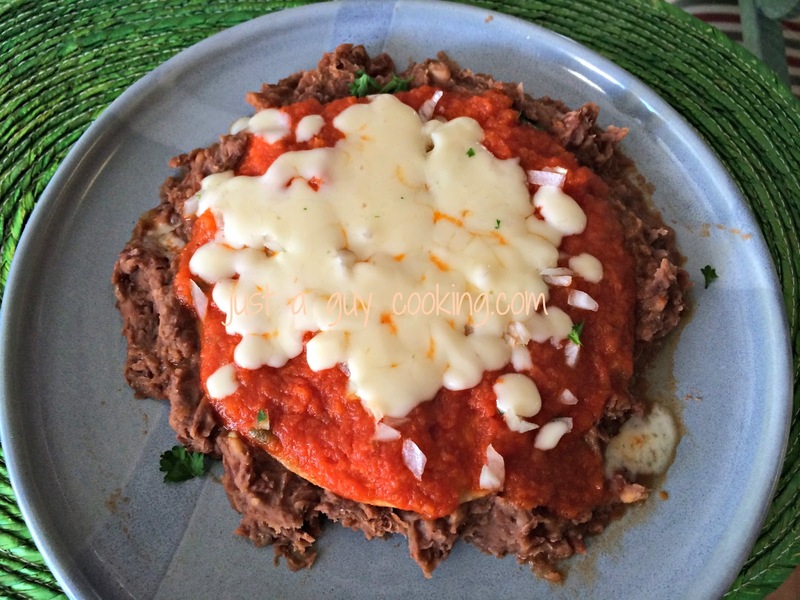 Pour the warm tomato sauce on the top tortilla. The beans are going to work as a “wall” so the sauce won’t spread in the plate. 7. Sprinkle the chopped onion and the grated cheese and put under the broiler until the cheese melts. In the few recipes I have posted, and of course when needed, I always use stewed tomatoes as a rule. The reason is quite simple: stewed tomatoes are sweeter, non acidic and taste better. If you can do some at home when in season, then you are in the right track. You can can as many as you want and use them through the year... the flavor is way better than anything that I have tried. You can jar (I was going to write can-can, but it just sound funny) as much or as little as you want. Here where I live tomatoes are usually expensive or they have been pre-frozen... not good. If desperate, then I use canned stewed tomatoes from the supermarket, I just verify the contents... if the first ingredients listed are tomatoes, onions, peppers and celery... then we are game, otherwise they are labeled as "stewed tomatoes" but God knows what is in the can. Always read the labels! * Tomatoes should be Roma, beefsteak or better boy. 1. 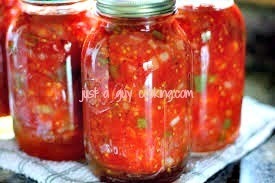 Sanitize the canning jars -they can be 500 ml or 250 ml-. This means that you can put them in the dishwasher in the sanitize cycle, lids and all OR submerge them in boiling water for 10 minutes. Then put them in a cooling rack to dry. 2. Prepare a medium pot with water and put it to boil. Also prepare a bowl of ice water (I leave some ice in it). 3. We are going to remove the skins first. In a pot with boiling water put the tomatoes for no more than a minute and immediately plunge them into the iced water bowl. With this basically you just got rid of the skins. We don’t want skins on the tomatoes as it makes them a bit bitter and not so smooth. 5. 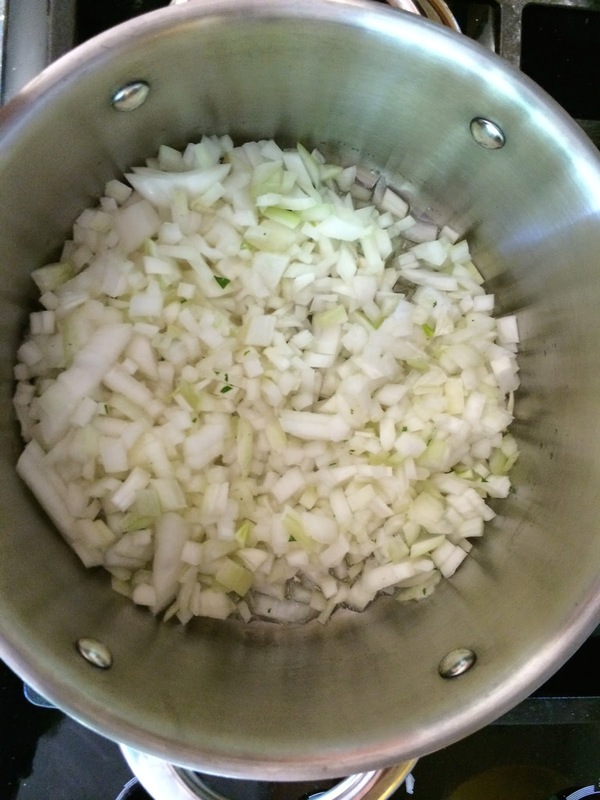 Chop the onion , celery and pepper -medium to fine- and reserve. 6. In a large pot combine the tomatoes, celery, onion, pepper, sugar (or honey) and salt but NOT the lemon juice. Cover and cook in a medium heat for 10 minutes stirring often. 8. Once the tomatoes are ready, fill each jar within 1” of the top. If you spill some, don’t worry, just clean it with a clean cloth so we get a good seal. 9. Add 2 tablespoons of lemon per jar (500 ml) or 1 tablespoon (250 ml). With this we avoid spoilage and retains flavor and color. Then fill to 1/2” of the top with boiling water. 10. Put the lids on and screw them snugly but not tight. Clean any spills. 12. Let the pressure cooker steam following the manufacturer’s instructions. Once steaming let it steam for 15 minutes or so. If you are doing it with a regular pot, let it boil for 20 minutes in high heat. 13. Once we have completed the steaming/boiling part we are going to let the pressure cooker cool down on its own (again, follow the manufacturer’s instructions) and if you are doing it with a pot, then remove the jars using the appropriate canning tongs -careful… the jars will be slippery and extremely hot! and remove them from the hot water and allow them to cool down in a non drafty area overnight. 14. Verify that all have sealed as intended (the lid has sucked down). Do the final check: press the center of the lid with your finger and if it pops down…then it’s not sealed. Don’t trow it though…put them in the fridge and use them later on. 15. Your stewed tomatoes are ready. Don’t panic if you see tomatoes floating above the liquid…it’s normal. If they are half-full also don’t worry, that means that you packed the tomatoes too tight but they still are 100 perfect to eat months and months later. Jeff Hertzberg and Zoe Francois are great bakers and very well known for their five minute artisan bread books and healthy recipes. As I discovered that baking makes me happy and relaxes me... I bake a lot. The idea is to see how much my wife can eat in a year... the experiment continues. These doughnuts are just amazing. They take a bit of time to prepare, but the end result is really tasty. They are best just out of the oven -like almost all bread-, but eating them the same day works too. I divide the recipe in three so I have fresh doughnuts three days in a row. Now, if you don't like doughnuts... I recommend a visit to the psychiatrist. 2 Small apples, diced (small dices). Do not use medium or large apples! First let’s try the yeast: In a small container mix the yeast (I use instant yeast) with a teaspoon of sugar and 1/4 cup of lukewarm water. Mix and let it set for 15 minutes. It should bubble and rise a bit, otherwise it’s not good. While the yeast is rising, in a large container mix the flour, brown sugar, salt, lukewarm water and butter. Mix until combined -by hand, not mixer as we don’t want to overwork the dough-. 3. By now the yeast should have risen, so let’s add it to our mix and fold until incorporated. 4. Add the diced apples and fold again. 5. In a warm place (I use the inside of my oven with a light on), we are going to put the dough to rise for two hours, so cover it with a damp towel and let it rest. 6. Once the two hours have passed, then we must chill the dough. We put it in the refrigerator for at least 3 hours (I leave it overnight, covered with a wet towel). If you don’t cool it…no doughnuts! 8. Preheat the oven to 350˚F. In a small bowl combine the granulated sugar with the cinnamon. 2. Form a ball with each piece and poke with your thumbs through the middle of the ball and create a hole. Stretch the “doughnut” so it’s about 3” wide. 3. 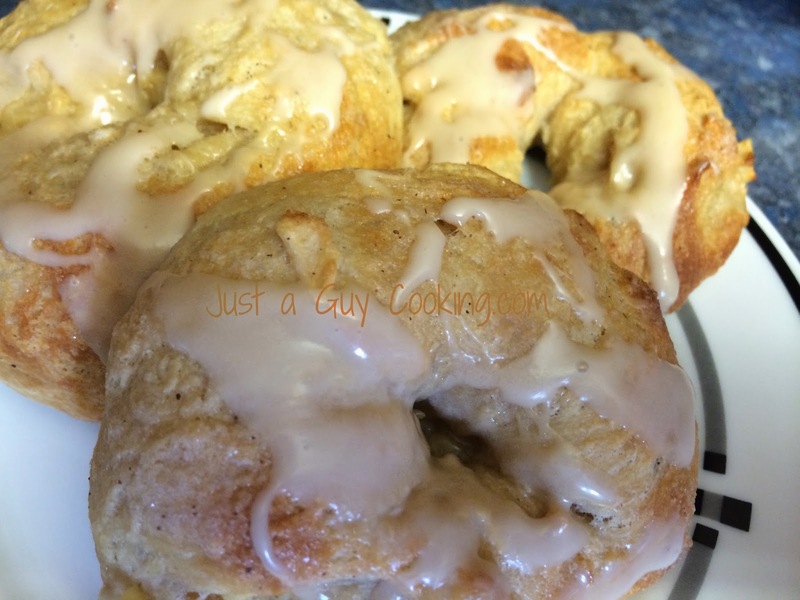 Dredge each doughnut in the cinnamon-sugar mix and place it on the baking sheet. I can only fit 6 doughnuts per sheet, so I reserve the rest of the dough in the fridge while I bake this batch. Once the doughnuts are ready, put them in a cooling rack with the parchment paper under to catch any drippings. 2. Drizzle the glaze over them and let them set up. I have a small family so I divide the dough in three parts and bake only one 6 doughnut batch per day -so I guarantee the freshness-. The remaining dough I keep in the fridge covered with a wet towel. The dough lasts for 3 days no problem. I like to cook, no doubt, but I am just a guy cooking not a Chef nor a Cook... just me...but I am curios and I like to read recipe after recipe until I find something that would appeal to me. This recipe is an adaptation of Nigel Slater's (now...THAT IS A CHEF). Yes, its true: I did not invented casserole. Back to this recipe: this is a wonderful dish for clod and crummy days. It spells HOME. Imagine, family, friends, home made bread, good wine and...a fabulous casserole. Life is good. 4. Once the beef is brown in some areas we are going to remove it and put aside, leaving the juices in the casserole. 5. Add the sliced onions and stir. If you feel that the mix is too dry, then add a bit of more butter and if the beef has released lots of juice, then drain the juice, just let enough to cover the bottom of the Dutch Oven. 5. Mix the flour. Stir. You should have a thick sauce, a bit thicker than apple sauce). If you need more flour, just add it bit by bit (otherwise we will have a cake!). We want a mix with no lumps. 7. The fun part: we are going to add the beer! (I usually use 3 bottles, two for the casserole and one for me while I cook). Stir. 8. Add the beef and the rest of the juices and place it in the oven, lid closed, for at least one hour and a half… should be enough to get a tender beef, but here is the tricky part: you want the meat to be soft but not disintegrating so with a fork check for softness. When your beef is too tender…less time, but if the beef is not tender we need more time…maximum another 40 minutes, otherwise the sauce will get sour. When ready remove it from the oven and let it seat, lid open. 9. Stir in the red currant jelly (if you don’t have it use raspberry, sour cherry jam or blueberry jelly…something that will add a kick, so sweet jelly is not an option). 10. Now… to serve: you can use as a side dish mashed potatoes, white or brown rice or noodles. Your choice.